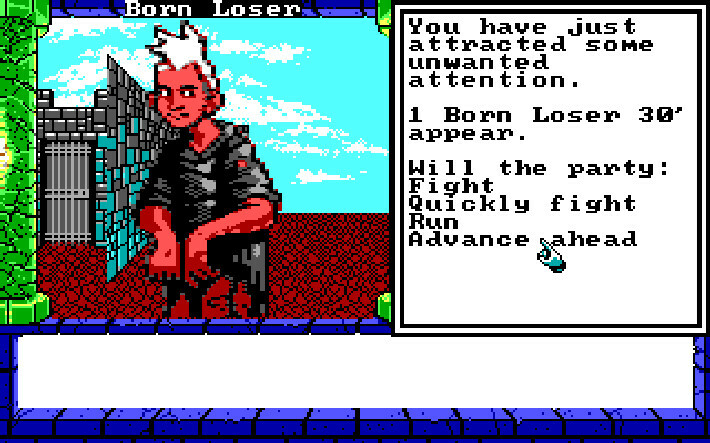 Original Release: 1990, Platform: PC, Developer/Publisher: Interplay, Image Source: GOG, Thanks to GOG for supplying my review copy. It makes me sad because, the more I learn about them, the more fascinating I find them and the era that produced them. It was a pioneering time where developers were striving not just to make products, but to adapt complex worlds and rules into gaming experiences unlike anything ever made before. The ambition of that period alone is something that I find to be inspiring. The problem with these games, especially when you only have a few weeks to play and review them, is that they tend to be exceptionally long. 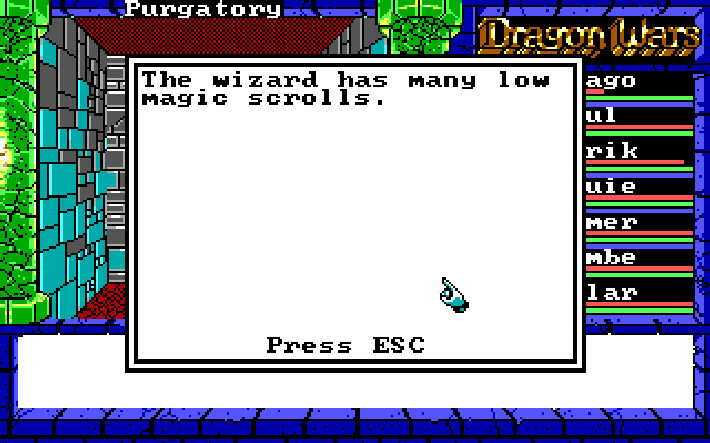 Reviewing Ultima IV, for instance, took me months. I started playing the game a bit everyday back in September 2013 (when Good Old Reviews started running) and didn't feel comfortable writing about it until December of that same year. Touching on games that expansive on a regular basis is something that would be really difficult. That being said, I've had a hankering to jump back into one for awhile now and GOG's re-release of Dragon Wars seemed like a decent opportunity to do so. Truth be told, I'd never even heard of Dragon Wars before seeing its release announcement. I have a huge soft spot for pulpy fantasy artwork however and seeing its box art immediately made me want to give it a try. As most gamers probably know, however, box art does not a great game make. I had no idea if the experience I was getting into was one that'd be worthwhile. 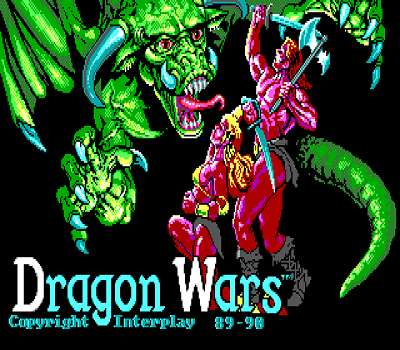 Luckily, Dragon Wars wound up being a fun and, in places, impressive RPG. Dropping the player into the world of Dilmun where magic has been outlawed, it begins with the player party being placed under arrest under suspicions of spell casting. Thrown into the prison slum of Purgatory, the player has to find a way to escape, bring peace to the land, and defeat the evil wizard Namtar. The story itself is pretty basic as far as fantasy titles go. You're the good guys and there's a baddie. Go forth and smite. That said, it's well-written and the text does a great job of illustrating the game's world where technical limitations prevented the graphics from doing so. I suppose that some might be a bit turned off by the fact that most of said text actually isn't in the game, but I rather enjoyed reading the story paragraphs contained in the game's manual. I got excited every time the words "Read Paragraph (Insert Number)" would appear on screen and, honestly, it was kind of nice to have the text be separate from the game. I sometimes have a tendency to skim and click through text when it appears on the screen. Having to read it in an actual document (though I would prefer a physical book to a PDF), ultimately made it easier for me to break out of my bad gamer habits and give the text the attention it deserved. The gameplay is similarly good, if perhaps a bit more weighed down in parts by its archaic bits. 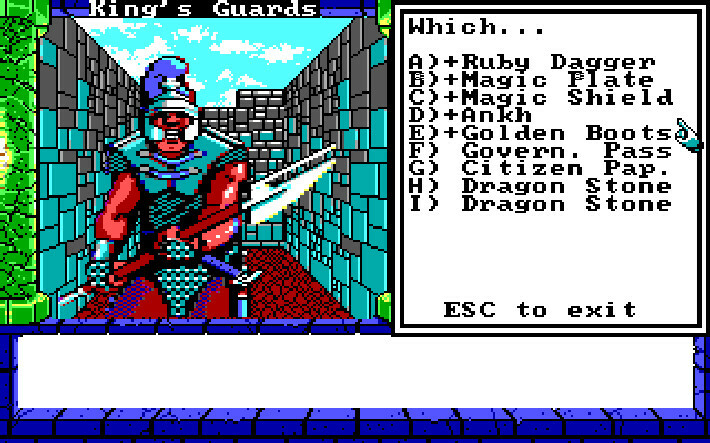 Made by the same designers who worked on The Bard's Tale series, Dragon Wars should feel familiar to anyone who spent any amount of time with the great old school dungeon crawlers. 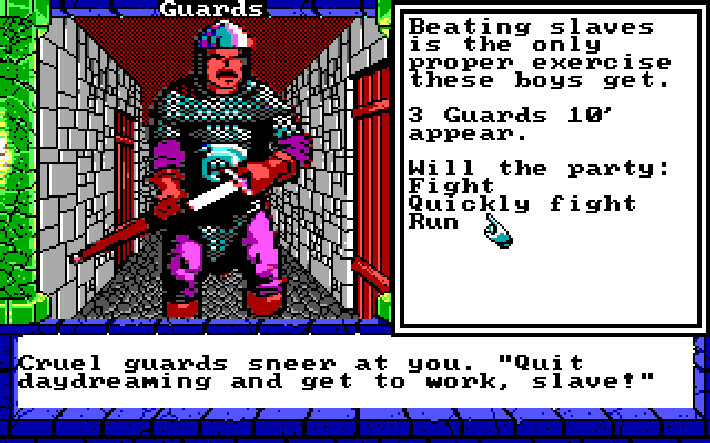 You're given a party of warriors whom you control from a first person perspective. You direct them around maps containing random enemy and fixed story encounters which you must resolve in combat or with your party's skills. Battles are turn-based and controlled via the keyboard, though there are some fairly redundant mouse control options available. 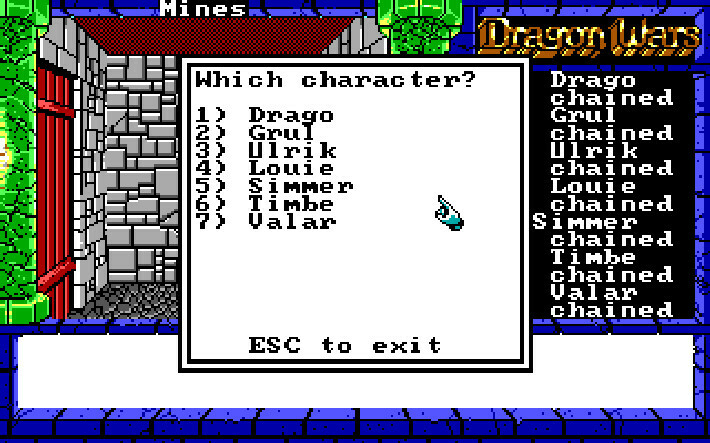 What perhaps sets Dragon Wars apart from other RPGs of this era is just how much effort has gone into giving you choices as to how you proceed and complete the game. Take the opening section where you have to get out of Purgatory. Rather than forcing you into one set method of escape, the game gives you five completely different paths out of the slum that range from selling yourself into slavery to disguising your party as dead bodies to get tossed into the sea. The game, overall, does a great job of giving you moments where there's more than one solution to your problems.